Back in 2009 Infiniti introduced G37 to replace G35. The more powerful model with better looks and features undoubtedly gained eyeballs. 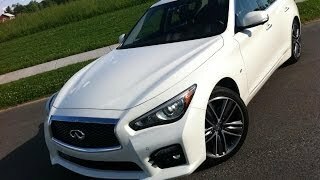 Now for the year 2014 company is again introducing a newer model Infiniti Q50S 2014, with more power and elegant looks portraying better design features. 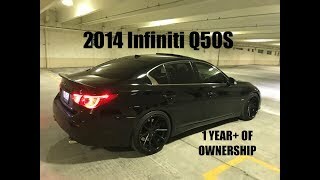 Let us have a sneak into the review of Infiniti Q50S 2014 to get to a conclusion. Interior of Infiniti Q50S 2014 is dipped into high quality materials, that add to the luxurious feeling providing you comfort. In front of the three spoke steering wheel are ergonomically designed seats (both front and rear) with very much focus upon driver’s position, so as to give him complete control over the car. However there is one thing in Infiniti Q50S 2014 that has been carried forward; the double wave design theme over instrument panel but with a new blend asymmetrical flow starting from center cluster till the center console. Not just these but interior of Infiniti Q50S 2014 offers you various options to customize your car by choosing the fabric and color. Exterior of Infiniti Q50S 2014 is dynamic with its body lines while elegant with its looks. Bumped lined can be noticed all across the exterior giving the decent model a muscular sporty touch. Front fascia of Infiniti Q50S 2014 looks sporty with the waved-mesh pattern and chrome giving support to the LED lights and massive air vent beneath inculcated in fender. 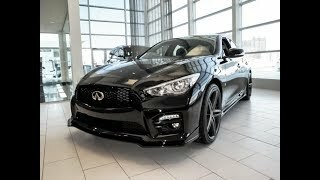 Moving towards rear fascia of Infiniti Q50S 2014 you’ll notice aggressive double-arch trunk line between the wide and elongated LED taillights while beneath them on each side are exhaust systems. Infiniti Q50S 2014 beneath its hood brings two engine options. The first one is 3.5 Liter V6 generating total output of 328 hp and peak torque of 365 nm while the second one is a Hybrid, with its engine developing 296 hp and 345 nm torque and electric motor adding another 64 hp and 270 nm torque, thus, the Infiniti Q50S 2014 thunders with the total output of 360 hp and peak torque of 615 nm. Both engines come paired to a seven-speed electronically controlled automatic transmission.